Santa and Mrs. Claus must rush to find a home for a foundling kitten named Cookie. Santa would love to keep the kitten, but he's allergic - and there's a little girl out there with the perfect home. Readers familiar with Pulver's Christmas for a Kitten will delight in Cookie's further Christmas Eve adventures. 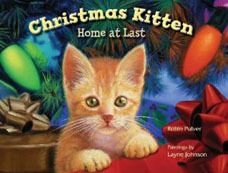 The sequel to a BookSense Best Book of 2003: Christmas for a Kitten.